"Rock You Like a Hurricane" / "Coming Home"
"Big City Nights" / "Bad Boys Running Wild"
"Still Loving You" / "Holiday"
Love at First Sting is the ninth studio album by German hard rock band Scorpions. It was released on 27 March 1984 on Harvest/EMI in Europe and Mercury in the US. The album contains "Rock You Like a Hurricane", "Still Loving You", and "Big City Nights", three of the band's most famous songs. The album was recorded in 1983 and 1984 at Dierks Studios in Stommeln, West Germany. Initial sessions took place in Stockholm's Polar Studios in the Summer of 1983 with ex-Rainbow members Jimmy Bain on bass and Bobby Rondinelli on drums, but nothing made it to the final album. Love at First Sting is notable in that it was one of the first digitally recorded hard rock records ever released. It became the group's most successful album in the US, where it peaked at number 6 on the Billboard 200 chart in 1984, and went double-platinum by the end of the year, reaching triple-platinum status in 1995. The song "Rock You Like a Hurricane" reached number 25 on the Billboard Hot 100 chart in the same year, "Still Loving You" reached number 64 on the same chart, number 14 in Germany, number 3 in the French and Swiss single charts. The original cover art was created by Kochlowski, which is a German graphic design company, and features a photo shot by renowned German photographer Helmut Newton. Despite the record company having shown the original cover art to retailers without any concerns, a complaint by Wal-Mart in the US after the album was released resulted in PolyGram Records issuing a "clean" cover for use in several department store chains. The alternative cover was designed to be less controversial by simply showing a photo of the band members, which was the same photo as the one on the inner sleeve. All lyrics written by Klaus Meine except where noted; all music composed by Rudolf Schenker. ^ Weber, Barry. "Scorpions Love at First Sting review". AllMusic. Rovi Corporation. Retrieved 11 November 2012. ^ Popoff, Martin (1 November 2005). The Collector's Guide to Heavy Metal: Volume 2: The Eighties. Burlington, Ontario, Canada: Collector's Guide Publishing. p. 319. ISBN 978-1894959315. ^ Gaguet, Guillaume. "Scorpion Love At First Sting review". Forces Parallèles. Forces Parallèles. Retrieved 28 October 2014. ^ Lerch, Uwe (1984). "Review Album: Scorpions - Love at First Sting". Rock Hard (in German). No. 5. Retrieved 18 June 2017. ^ Loder, Kurt (26 April 1984). 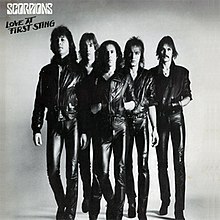 "Album Reviews: Scorpions - Love at First Sting". Rolling Stone. Archived from the original on 14 October 2007. Retrieved 11 November 2012. ^ "SCORPIONS Guitarist Doesn't Rule Out Recording New Album With MICHAEL SCHENKER, ULI JON ROTH". BLABBERMOUTH.NET. 2005-08-30. Retrieved 2017-09-17. ^ a b c d e f "Love at First Sting Billboard Albums". AllMusic. Rovi Corporation. Archived from the original on 25 November 2013. Retrieved 11 November 2012. ^ a b "Single – Scorpions, Still Loving You". Charts.de (in German). Media Control Charts. Retrieved 11 November 2012. ^ a b "Scorpions – Still Loving You (Chanson)". Lescharts.com. Media Control Charts. Retrieved 11 November 2012. ^ a b "Scorpions – Still Loving You". Hitparade.ch (in German). Media Control Charts. Retrieved 11 November 2012. ^ Jeffrey Easton. "Metal Exiles interview with Klaus Meine'". metalexiles.com. Archived from the original on 21 April 2010. Retrieved 21 April 2010. ^ Nuzum, Eric (2001). Parental Advisory: Music Censorship in America. New York City, New York: HarperCollins. pp. 78, 245. ISBN 978-0688167721. ^ Nuzum, Eric. "1980's Censorship Incidents". Archived from the original on 5 October 2003. Retrieved 19 January 2009. ^ "Love At First Sting". Scorpions. Archived from the original on 8 December 2012. Retrieved 31 December 2016. ^ "Album – Scorpions, Love at First Sting". Charts.de (in German). Media Control Charts. Retrieved 11 November 2012. ^ "Scorpions – Love at First Sting". Hitparade.ch (in German). Media Control Charts. Retrieved 11 November 2012. ^ "Top Albums/CDs - Volume 40, No. 15, June 16, 1984". Library and Archives Canada. 16 June 1984. Retrieved 11 November 2012. ^ "Scorpions – Love at First Sting (album)". Swedishcharts.com. Media Control Charts. Retrieved 11 November 2012. ^ "Scorpions – Love at First Sting (album)". Austriancharts.at (in German). Media Control Charts. Retrieved 11 November 2012. ^ "Scorpions – Love at first Sting (album)". Charts.org.nz. Media Control Charts. Retrieved 11 November 2012. ^ "Top Singles - Volume 40, No. 18, July 07 1984". Library and Archives Canada. 7 July 1984. Retrieved 11 November 2012. ^ "Scorpions - Rock You Like a Hurricane (Nummer)". GfK Dutch Charts (in Dutch). Media Control Charts. Retrieved 11 November 2012. ^ "Scorpions – Still Loving You". Ultratop (in Dutch). Media Control Charts. Retrieved 11 November 2012. ^ "Scorpions – Still Loving You (Nummer)". GfK Dutch Charts (in Dutch). Media Control Charts. Retrieved 11 November 2012. This page was last edited on 4 January 2019, at 05:56 (UTC).